Passed earlier this week by the West Virginia Senate, Senate Bill 451 - also known as the Education Reform Bill or Omnibus Bill – has been a subject of controversy among educators. The “omnibus” title refers to the definition of the word, the combining of several separate items. Originally, the bill contained a non-severability clause meaning that it’s all or nothing; that if any part of the bill is struck down, the whole thing is out the window. And it’s some of those other issues – mainly the proposal of charter schools and educational savings accounts, as well as seniority issues - that have had educators concerned. On Wednesday, The House Education Committee did some tweaking of the Senate's version of the 129-page bill, removing the non-severability clause and paycheck protection which would require union members to annually sign off on dues. According to the amended version of the bill, educational savings accounts – vouchers for students moving from public schools to private education – would be implemented for special needs students only. The amendment also called for capping charter schools off at six and eliminating virtual charter schools. (Update: Thursday, the House limited charter schools to two elementary schools; one in Kanawaha County and another in Cabell County.) Whereas the Senate bill stated for wages to be withheld during work stoppages, the revised draft allows for wages to be repaid once school days are made up. Thursday, the Speaker of the House of Delegates called for consideration of a public hearing on the bill. It was announced Thursday evening that will take place Monday. Prior to the House proposing the draft which would implement above-described changes, Lister shared in detail some concerns of educators. “We are against the charter schools, against the education savings accounts/voucher programs. We are against attacks on seniority and anti-union measures, anti-strike legislation and paycheck protection,” he said. Lister said although he believes there are situations and locations where charter schools can help students reach full potential – such as in inner-city areas, for special needs students and when run by non-profit organizations – they are not the answer for raising the bar here in West Virginia. Taking dollars from public education to use in charter schools creates a situation when there is no accountability. Charter school teachers do not need to have education degrees – or college degrees of any kind. They do not have to be offered PEIA insurance and are at-will employees whose employment can be terminated for any reason. There is also no guaranteed transportation for charter school students, Lister said. Supporters of the bill say it’s about a more quality education for West Virginia students; that the state ranks quite low in educational aspects. Forbes magazine rates the Mountain State and Mississippi tied for 50th place in its list of most educated states. U.S. News and World Report ranks West Virginia 45th in its rankings, measuring how well states are educating their students. There is certainly room for improvement in the education system, but adoption of a bill put together with no input from West Virginia educators is not the way to accomplish that, Lister said. States ranked higher in education are doing a better job providing proper funding of public schools, offering extracurricular support, after-school programs, counseling services and emotional support, Lister said. “We know those extra wraparound services can improve the education system in West Virginia,” he said. Simpson Elementary teacher Matt McCullough said he is also appreciative of the fact that the House appears to be listening to their constiuents and moving at a drastically slower pace than the Senate. He is hopeful that the dialogue with members of the House continues to move in a positive direction. To help apprise residents and keep them up to speed on the evolvement of Bill 451, area educators are hosting an informational meeting at 6 p.m. Monday, Feb. 11 at All Saints Catholic Church in Bridgeport. "I encourage parents to attend the informational meeting because they shouldn't have to learn the effects this piece of legislation has on their children after the fact," McCullough said. "Instead, parents should be proactive and understand how the bill could impact their children's education in the future - should it pass." Many of the issues wrapped up in the Education Reform Bill and opposed by educators are issues for which they walked out in 2018. “Much of the public still thinks the only thing we went on strike for was the pay raise, when in reality although that was important, it was also about PEIA – which still hasn’t been fixed,” he said. Although not included in the proposed bill, Gov. Jim Justice does propose to allocate $150 million to stabilize PEIA for the next three years. Yet that is still not a fix, Lister said. Other issues for which teachers stood against in 2018 include proposed charter schools, vouchers, seniority and paycheck protection. “As a union, we fought that we weren’t coming back unless these issues were out,” he said. Lister said teachers are prepared to say no to an additional five percent pay increase it if means it comes along with stipulations which they believe are derogatory to the best interest of students and their education. He encourages residents to attend Monday’s public meeting at All Saints Catholic Church. On behalf of his fellow educators, he also encourages members of the public to reach out to delegates. Ashley Edgell, Bridgeport Middle School educator, said it is important that the community be proactive about SB451, which could potentially open the door for charter schools and divert funds from public schools. "This is not just a 'teacher thing,' this is a 'community thing,'" she said. "It affects us all ... Our children deserve the best in education and this bill directly contradicts that quality education that they deserve." She encourages community members to come out Monday and learn the facts, which will speak for themselves. 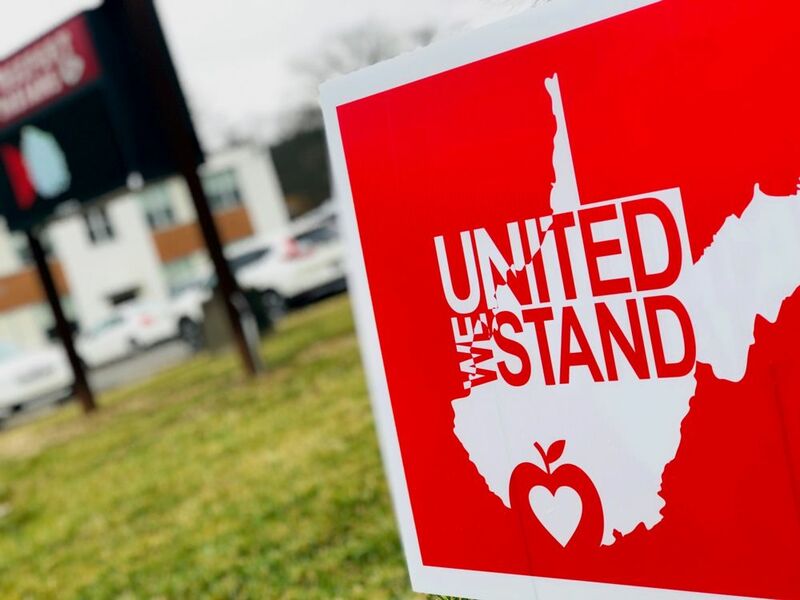 "The teachers of West Virginia will never stop fighting for what's best for our students," Edgell said.